Since I was little I have been a fan of the Goo Goo Dolls-and I must admit, my love has yet to fade! I have pushed, begged, and pleaded for the band to come play at JMU, and while that has still not happened, I won’t let the idea go. From “A Boy Named Goo,” to “Dizzy Up the Girl,” to their most recent 2010 album, “Something For the Rest of Us,” the Goo Goo Dolls have not failed to write a song that hits home and never gets old to me! I think my favorite song of all time by them would have to be “Slide,” but “Name” is also a close second. Even off of their newest album, I really like the song “Not Broken” (live video below!). I don’t think the band will ever stop making great music! Despite a diverse and changing world, Goo Goo Dolls continue to write music that speaks to fans everywhere. Don’t worry, JMU; I will never give up hope of the Goo Goo Dolls performing here (maybe in the Fall?! ), playing a little something for the rest of us! There is nothing dull about being the Director of Spirit & Traditions for the University Program Board! I have the challenging and rewarding task of coordinating Funny Freakin’ Fridays and Late Night Breakfasts for every month of the school year, with the help of a committee of 25 members. Once the committee has come to a consensus about theme we want, it is my job to work out the logistics; what activities, crafts, and food would compliment this theme? What companies can provide such entertainment? Will it fit into my budget? A lot of things have to be decided and considered to bring an event together and make it a success, but once I have accomplished those things, it’s so rewarding to see the final execution of the event and all the students that come out to it and have a blast. How great to see the hard work you put in pay-off, and your ideas come to life-all for the student body to enjoy! Hey everyone, my name is Melissa, and every month I plan and coordinate a Late Night Breakfast (LNB) in Festival. At every LNB you can find music, food, crafts and exciting activities; all of which are based around a theme. Past LNB themes have included Disney, Safari, Luau, Hard Rock Café, and Pirates. But how do we choose these themes? I work with a committee of about 25 members, and we meet once a week to discuss ideas for Late Night Breakfasts and how we can make them really happen! I generally start out by asking the committee to come up with the crazies t and most extravagant ideas for a theme and/or activities, and from there we work our way down to decide on a theme that is feasible and within our budget. 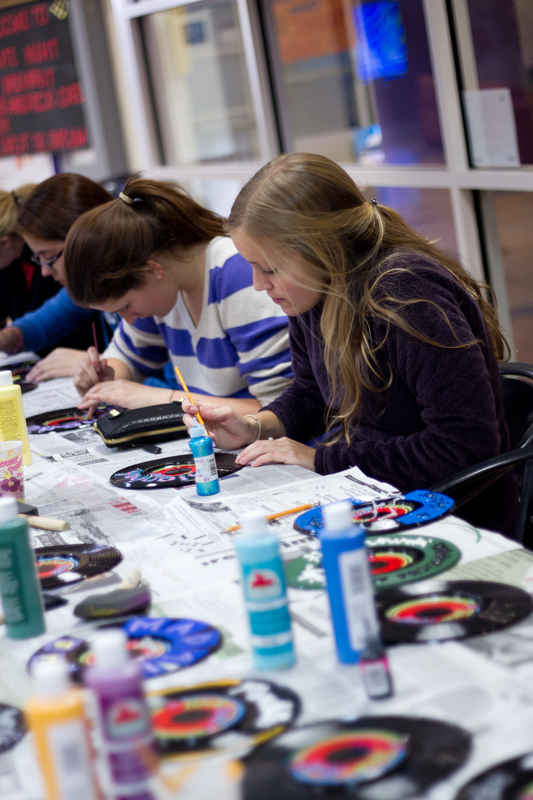 We then spend the weeks leading up to the event choosing all the activities and crafts that will complement our theme, and we spend a lot of time trying to come up with things that we know JMU students would love to come to Festival to do! For all of our inflatables, such as the giant Shark Slide on the Festival Lawn, we actually call in a company from Pennsylvania to set-up and facilitate the activity! ﻿From decorations to the food, our committee thinks of every way possible to bring all of our visions and students’ suggestions together and make each LNB fabulous and entertaining! We’re looking forward to all the great themes coming up next semester! Are you excited? !